VPN4ALL is an interesting personal VPN service with different packages geared at users with diverse needs. All packages are reasonably priced, and VPN4ALL’s apps are highly rated for mobile users. The company has been providing VPN services since 2009, so they have ample experience. More than 37,000 customers use their services every month, and the company promises 99.99% uptime. Whether you are looking for a VPN service to help you stream multimedia, protect your privacy, or access services globally from blocked countries or regions, VPN4ALL is worth a look. You want to stream video, watch IPTV or listen to online radio from any location and any type of internet connection. VPN4ALL offers an account type specifically for this purpose. You want to unblock websites on specific networks. You need enhanced privacy while you are surfing the web and want to keep your transactions encrypted and away from prying eyes. You are looking for cheap calling rates. VPN4ALL allows you to enjoy reduced rates on “local” calls and also to save money by purchasing in local currencies no matter where you are located. Unblock PayPal, no matter where you are located. Microsoft Windows: XP SP2 and higher. Windows smartphones and tablets: Will work on some models. Blackberry smartphones and tablets: Will work on some models. Mac: Mac 10.5 and higher. VPN4ALL is fantastic about device support, and is very clear about operating system and hardware requirements, including the “some models” mentioned above. Scroll down on the main page, and you will find a list of all supported devices and operating systems along with advanced information on minimum specifications. You should be able to tell at a glance if your device is supported. This is one of the few VPN services we have seen that even mentions Blackberry and Windows smartphones. It’s also great that it is compatible with Linux! 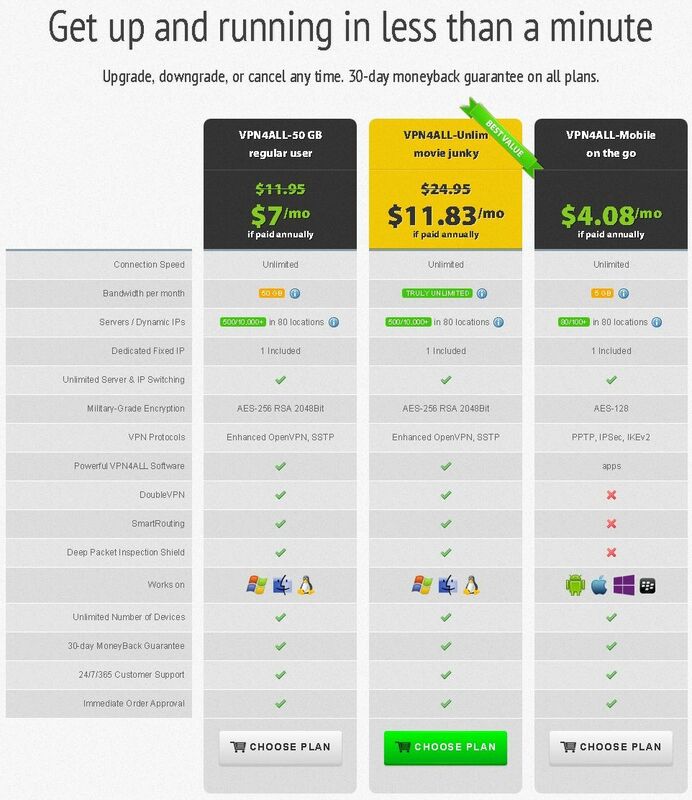 There is no free trial per se for VPN4ALL, but there is a 30-day money back guarantee. That means you can in effect test drive the service for a month before you make up your mind, risk-free. You just need to be willing to make the up-front payment. While this is not ideal, it is better than nothing. Because there is no free trial, it is a good idea to just purchase one month to start with to make sure you really like the service before you buy an annual package. Three different plans are available for VPN service through VPN4ALL. You can save money on each plan if you are willing to pay for a year at a time. The different plans are geared at different types of users, so one plan will probably be ideal for you. Aside from the differences noted below, all of these plans contain the same features. VPN4ALL-50 GB: Regular User. This plan costs $11.95 per month, or $7.00 per month if you are willing to buy a year at a time. You get unlimited connection speed, but you are confined to 50 GB of bandwidth per month. VPN protocols include Enhanced OpenVPN and SSTP. Security is AES-256 RSA 2048Bit. VPN4ALL-Unlimited: Movie Junky. This plan costs $24.95 per month, or $11.38 per month if you are willing to pay annually. This plan likewise includes unlimited connection speed, but it also comes with unlimited bandwidth. If you are paying for this month to month, it is pretty expensive compared to a lot of other services, but it is not bad if you are paying for the whole year at once. Encryption and protocols are the same. With both this plan and the one above, you get access to more than 10,000 IP addresses in 80 locations, and as many as 500 servers. VPN4ALL-Mobile: On the Go: This plan costs just $4.08, and must be purchased as an annual package. Especially designed for mobile users, it includes 5GB of bandwidth per month and unlimited connection speed. You get access to 100 IP addresses and 80 servers in 80 locations. Security is AES-128 and protocols include PPTP, IPSec and IKEv2. This plan is missing some of the extra features that the other two include, like DoubleVPN, SmartRouting and Deep Packet Inspection Shield. You can get a full refund on your first 30 days as long as you do not exceed 100MB of bandwidth. Fill out a Refund Request and submit it for your money back. Again, this is the closest thing to a free trial that VPN4ALL includes. How many IP addresses and servers you have access to depends on the package you buy, as described previously. The mobile tier does not include all of the IP addresses and servers. If you purchase either of the other two plans, you have 500 servers in 80 locations to choose from, and an IP pool of 10,000 addresses. All users receive their very own static IP that they can always use from any location as well. Servers are distributed nicely throughout the world. Along with North America and Europe, countries in Asia, South America, and the Middle East are available. There are no servers in Australia. The bandwidth depends on the package you buy. For the “Regular User” package, you get 50 GB per month. For the mobile tier, you get 5 GB per month. Those who purchase the “Movie Junky” package get unlimited monthly bandwidth. 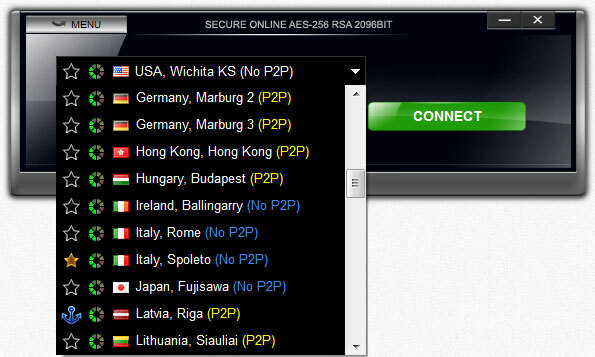 The VPN4ALL user interface is simple and clear and it is easy to get online on a server of your choice. An options menu does include advanced controls for users who want to enable TCP servers, port forwarding and more. On Google Play, the VPN4ALL app has more than 1,000 reviews and an average rating of 4.2 out of 5, which is pretty good. More than 720 of the reviews are 5 stars, encompassing the vast majority of the ratings. Users on the whole report very few disconnects, and report that VPN4ALL provides smooth, stable service. Speed tests give varied results. Generally with most servers, you can expect speed comparable to the speed you get without the VPN, but for some servers you may experience a significant slowdown. You will need to experiment and figure out which servers are fastest and most reliable for you. The security protocols depend on the protocol you are using and the service tier you have purchased. For the Regular and Movie Junky accounts, you get AES-256 RSA 2048Bit security, which is pretty high grade. For the mobile account, you get AES-128. The parent company that runs VPN4ALL is located offshore, and is not obligated by any local laws to maintain logs. So you can rest assured that your activity goes unlogged. Customer service for VPN4ALL is available 24/7. For simple issues, live chat is available, and you can get a quick answer to your sales or technical question. For complex issues, you must use an email ticketing system and wait for a reply. The live chat is a nice feature; a lot of VPNs do not provide any way to contact a live agent at any time. Judging from reviews, the support team is not always at the live chat desk. So the 24/7 probably refers to the ticketing system. Customer reviews are mixed on service, but generally positive. The biggest drawback with VPN4ALL is the fact that you cannot try it for free without putting money down first, but the 30-day refund is a nice offer. It would also be great if the live chat team staffed the desk 24/7, but the fact that they offer live chat at all is already an improvement over a lot of other companies that offer VPN services. There is a lot about this company and their services that we like. The different pricing tiers are structured in a way that makes sense. Instead of simply dividing the tiers up in a system that is based on “okay, good, better, best,” they are dividing the tiers based on actual user needs. The multimedia package is expensive, but unlimited, and perfect for those who do a lot of viewing or gaming. The mobile package is cheap, simple, and powerful. The regular deal is perfect for users in-between who need more than what the mobile package offers, but do not want to pay a lot of money for bandwidth they do not really need. VPN4ALL is worth considering no matter what type of user you are. They are well-established, have a strong reputation, offer smart and affordable pricing tiers, and are popular with users around the globe. Have a look at their account types and give them a try. Remember to try just one month to begin with; you might want to try different account types to find the one that suits you best before you buy a year of service.